This section provides more guidance on resilience as it relates to the Presidents’ Climate and Resilience Commitments. Resilience is a new concept for many people, and guidance is evolving in response to learning across the Climate Leadership Network. Please refer to the Commitments Implementation Handbook for more explicit instructions on implementing the Commitments. Resilience doesn’t come with a specific roadmap and a universal set of steps to follow. Second Nature provides some important components and criteria of resilience, as well as questions and examples to guide thinking and planning. However, the resilience of any campus or community will be based its own unique set of characteristics, future goals, existing capacity and strengths, and current and future vulnerabilities. Part of developing increased resilience is undertaking the social engagement, assessment, and planning process itself. The most successful campus resilience plans will be those that fully embrace the catalytic nature of resilience assessment and planning, and that incorporate diversity and inclusiveness throughout the process. Resilience touches on all aspects of a campus and surrounding community. To help campuses think comprehensively about resilience, Second Nature breaks it down into five dimensions. These dimensions are not mutually exclusive. They are meant to encourage a holistic assessment of resilience and adaptive capacity. 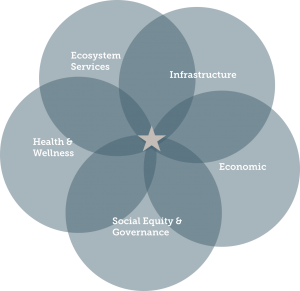 Considering each of these dimensions in the context of climate change will help campuses and communities develop a resilience plan that addresses the entire system. Resilience is not just about survival and bouncing back from disruptions; it is about being able to thrive. Dimensions for campuses and communities to consider in creating a resilient system.